A STARRY NIGHT SKY THEMED WEDDING IN TEXAS WITH TRADITIONAL FINNISH ARTS & CRAFTS! Nicole and Veli Matti were keen to include personal touches that reflected both their Texan and Finnish roots. The couple included a pop up Himmeli station where guests could make their own traditional arts and crafts and took inspiration from the starry night sky, to create this beautiful wedding full of constellations, metallics, simple geometric lines & Scandinavian minimalism. The couple loved the look of constellations, metallics, simple geometric lines and Scandinavian minimalism. “We tied the look together with lots of little details, from beautiful bronze himmeli (a traditional Finnish craft) for the ceremony backdrop and glittering gold- and silver-sequins dresses for the bridesmaids, to our planetarium-inspired invitation suite and programs that doubled as star guides. Our cake was part of the ‘minimalist glam’ look we were going for with a stark, modern white buttercream accented with edible crystals and geodes for sparkle. I also can’t say enough good things about our floral arrangements and bouquets (and our amazing florist, Jody!). 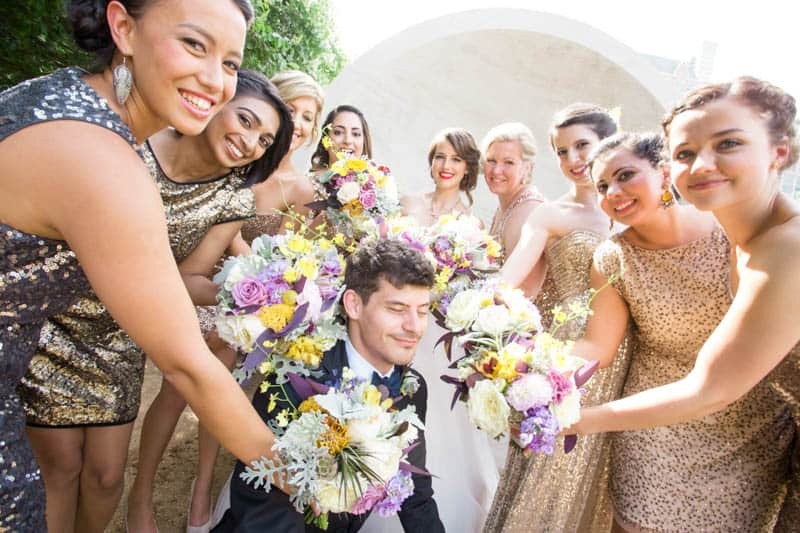 The flowers were incredible and helped make the event feel more ethereal” She continued. Simply beautiful. Everyone looks so glam and excited. Amazing photos, very beautiful everybody!! !